Esterel is a luxury camping site that is found conveniently close to Cannes as well as beautiful Saint Tropez. Read more online here at Lux-Camp for more details on how this magical spot can become your next dream vacation. Should you and your family wish to experience this wonderful location, please do not hesitate to contact us at your earliest possible convenience. Why Should I Camp at Esterel? No less than 495 pitches. 15 hectares of pristine land. Dogs are welcome on this site as well; a convenient option as opposed to boarding a pet abroad. A camping holiday should always include access to the modern amenities of life. Thankfully, all guests at Esterel area able to enjoy free Internet access during their visit. This is combined with other conveniences such as washing machines, tumble dryers, wheelchair-accessible bathroom facilities and power that is supplied to every one of the 495 pitches. Those with a mobile home will be pleased to learn that there are waste disposal services as well as a petrol station. 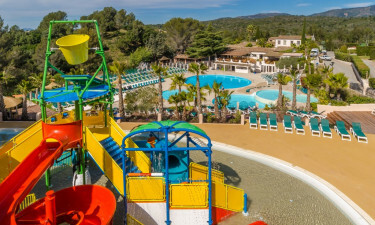 Children can also enjoy the levels of luxury camping offered by Esterel. In fact, this site is quite child friendly. Baby changing rooms are available while there are a number of unique entertainment services provided. 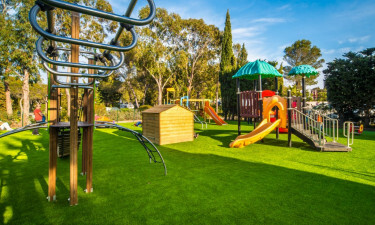 A dedicated play area can be enjoyed while miniature golf is a perfect distraction for the entire family. 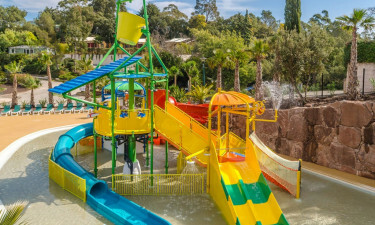 This holiday camping site boasts a number of fun and exciting sporting activities. Due to its proximity to the sea (only 3 kilometers), sailing and surfing excursions can be enjoyed during the warmer months. However, on-site sports are just as popular. Some of these include (but are not limited to) outdoor and indoor pools, tennis, table tennis and golf. After a long day of physical activities, this luxury camping site provides guests with a sauna to sit back and relax. This sense of camping luxury is completed thanks to a restaurant that is located within Esterel. Headed by chefs Christoph and Anne, many provincial specialties are included in the menu while exotic cuisine is also an option. This unique taste is complimented by teak wood dining facilities that overlook the nearby waters. A classy bar known as Les Suds is also found within; ideal for those who have a taste for fine cocktails.